Handlers of President Michael Sata swapped his speech and curtailed his desire to create the position of Prime Minister! 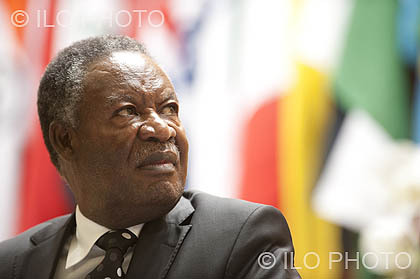 Former Finance minister Alexander Chikwanda has made a startling revelation that President Michael Sata was heavily undermined by his aides and close associates to an extent that they swapped his desired presidential address . Chikwanda said Mr Sata was forced to abandon the speech after recognizing that the speech was tampered with to circumvent his wishes and pronouncement. As we continue with our development agenda that will transform our country and banish poverty I have great pleasure to join this Honourable House on the wonderful occasion to officially open the Fourth Session of the Eleventh National Assembly. With a very heavy heart I remind the nation that during the Third Session of the Eleventh National Assembly the House lost a diligent and dutiful member, Honourable Dr. Patrick Mwewa Anthony Chikusu, Member of Parliament for Katuba Consitutencty who was Deputy Minister of Health who passed away on 2nd December, 2013. May the Good Lord continue to rest the soul of this tireless servant of humanity in eternal peace and may I now request the house to be upstanding and observe a moment of silence in honour and memory of our beloved dear colleague. Members of Parliament to duty but amply show the resolve of the house to call the executive to account. These checks on Government are essential steps in strengthening democracy and setting good governance bench marks. During the course of the session, 7 members who won the by elections were sworn in the house. I congratulate and welcome these members to the house. I am persuaded beyond doubt that they will add value to the proceedings of the house. Even in the most trying moments you were outstanding in giving guidance and leadership to the house and we have a duty to thank you. I equally extend my thanks to the Deputy Speaker and the Deputy Chairman of Committees of the whole house. Your two colleagues were a remarkable reinforcement. It would be remiss of me if I did not acknowledge the stupendous efforts of the Clerk of the National Assembly and her equally diligent staff who have always served with distinction. His Honour the Vice President as leader of the House has executed his assignments with noticeable focus and devotion. I pay tribute to him as I commend all Honourable Members of Parliament for vigilance in safeguarding the interests of their electorates effectively. should be a landmark for the Zambian Parliament which is in many ways a role model of democracy. I note with pride that the National Assembly has continued implementing the Parliamentary reforms. It is significant that as of September, 2014, the National Assembly had constructed 20 permanent offices using government funds. Three other offices are about to be constructed while construction of another 15 new offices with support from cooperating partners will commence before the end of the year. The final goal is for the National Assembly to have its own permanent structures in all the 150 constituencies and I am hopeful this will be achieved in due course as funds permit. I call upon more cooperating partners to partner with the Government in providing financial support for the construction of constituency offices to speed up this important programme for the benefit of the people in all the constituencies. The process of establishing a parliamentary budget office is scheduled to commence before the end of this year and the Parliament is receiving technical assistance from cooperating partners for this purpose. In this regard, the Honourable Minister of Finance will in due course bring to this house the budget and planning bill to give effect to the full realization of this project to enhance the participation of the people and their representatives in the Budget process. poverty. Investments in infrastructure to facilitate and accelerate development will continue at a brisk pace as will investment in the growth sectors of agriculture, energy and mining which is private sector driven. The social sectors of education and health will receive enhanced attention. Development of countries requires a healthy nation and education ensures citizens increase their productive capacities. It is government’s primary duty to provide security and law and order for citizens to live in peace and perform their duties without hindrance. Adequate resources will be provided to the defence and security subsectors. In fulfillment of our obligations to posterity my Government will take all necessary measures to prevent resource misuse and misdirection. It is imperative that government limits budget deficits to reasonable levels to avoid excessive borrowing both locally and externally. Loans have to be repaid and there is need to avoid debt traps as has happened before. Parliament has the exclusive mandate and prerogative to make the laws for our country including the fundamental Law of the land, the Constitution. I have found it appropriate to release the draft Constitution to Parliament before it is available to the public and civil society. duty and poor work culture and improper programmes of action. These deficiencies cannot be remedied by even the best of constitutions. Only resolve, commitment and change in the mind sets can guarantee sustained development of our country. The nation has placed on my shoulders heavy responsibilities to be custodian of people’s interests and to offer guidance when and if appropriate. My considered advice to the Zambia people is that we should take time to effect changes to the Constitution that will stand the litmus test of time. Let us divorce our partisan and personal interests from the Constitution which we should all ensure is a credible legacy to many generations to come. There are many pertinent issues that warrant our deep reflections. One relates to the current excessively costly electoral system that consumes inordinate resources that should be deployed on poverty reduction programmes. It may be prudent to consider less costly alternatives like proportional representation. This electoral system distributes seats more equitably and fairly and precludes unsustainable costs implicit in By-elections. The other issue the country may wish to give consideration is the Executive Presidency in relation to distribution of power and checks and balances. As we have seen in the not too distant past it is not always that Presidents have acted with moral restraints expected of them. It is therefore not inexpedient for the country to consider separating executive functions from the presidency by reassigning those functions to another office like a Prime Minister. At the end of the day the prerogatives to design the Constitution are reposed in the Zambian people. All I am doing is to share reflections with you from a position of trust and wider experience you have entrusted me with. Zambia in a troubled world has moved on in peace and harmony largely due to the collective wisdom of all our people who assign primacy to human fellowship and have desisted from Divisions which have inflicted misery and death on many countries on our continent and the world. We have a huge task before us to eradicate pervasive poverty in many parts of our country. This can only be possible if we continue to cherish unity in diversity. My administration has from its inception fostered inclusiveness and this remains the only option going forward. We have talked of giving power to the people using tools like decentralization. To give meaning to this noble objective the 2015 budget will start the process of revenue sharing by placing significant resources at the disposal of local authorities. The biggest challenge will be prudent use of these resources at local authority level. It is my ardent prayer, hope and expectation that beneficiary institutions at various local levels will ensure that there is no cause to think trust and confidence were misplaced or misallocated by the central government. As I declare the Fourth Session of the Eleventh National Assembly open I ask the nation in praying to God almighty that he continually guides us to maintain the spirit of togetherness that makes us a role model country that always pushes forward the frontiers of our common humanity.